An early start and a two hour drive down the heaving Queen Elizabeth Way and Lisa, Ben and I were parked up and ready to see the natural wonder that is Niagara Falls. Before we had arrived Lisa had warned me that the area around the falls and the car park were spectacularly tacky. 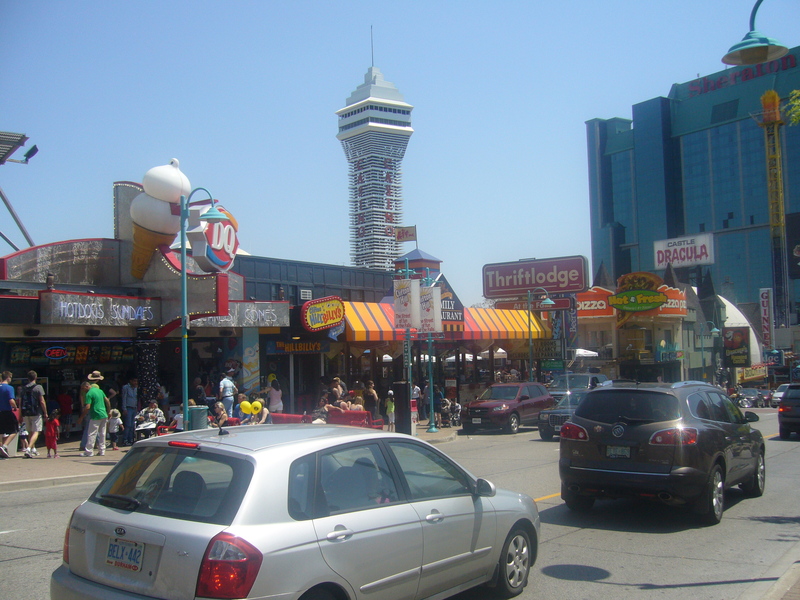 Even with this forewarning I was not expecting the area known as Clifton Hill to be quite as awful as it was. In fact, it is so bad that you begin to really appreciate it for exactly the same reasons that you would be expected to hate it; the bright lights, garish colours and desperate attempts from all angles to snare tourist dollars. 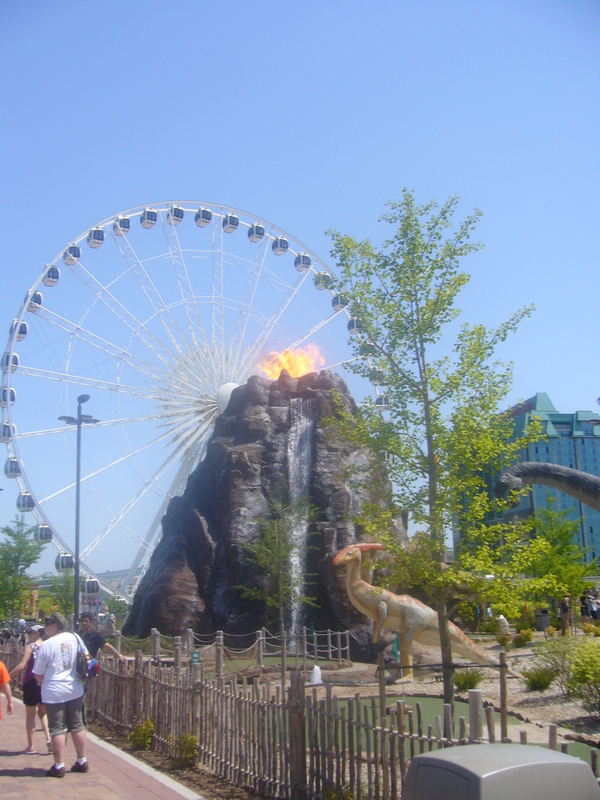 I stepped out of the car, and the first thing I saw was a tyrannosaurus and a volcano with a ball of fire shooting from the top of it and this was just a mini golf course. The walk down to the falls offered glimpses of arcades, restaurants, mirror mazes and haunted houses and I expect there were many more attractions that I didn’t see. 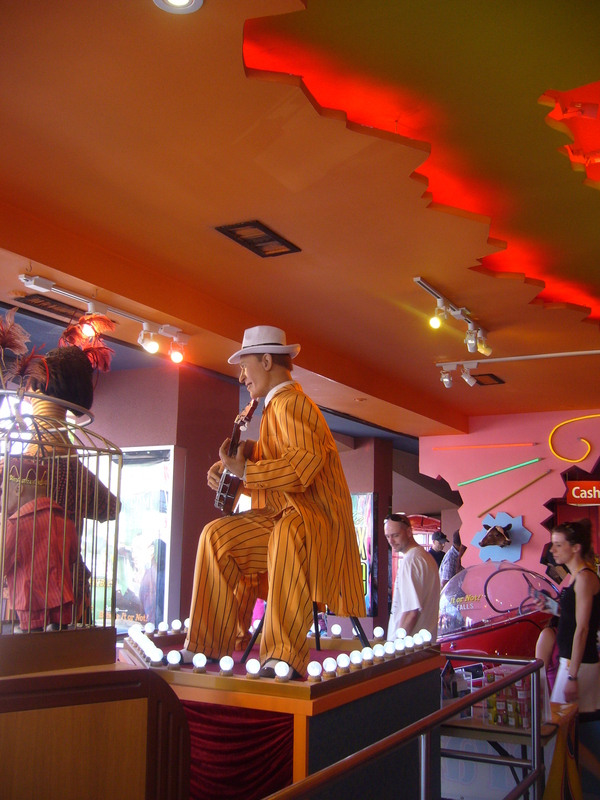 It was as though the carnival had come to down and never bothered to leave. However, once free from the clutches off Clifton Hill I was greeted with the sight of the American Falls. 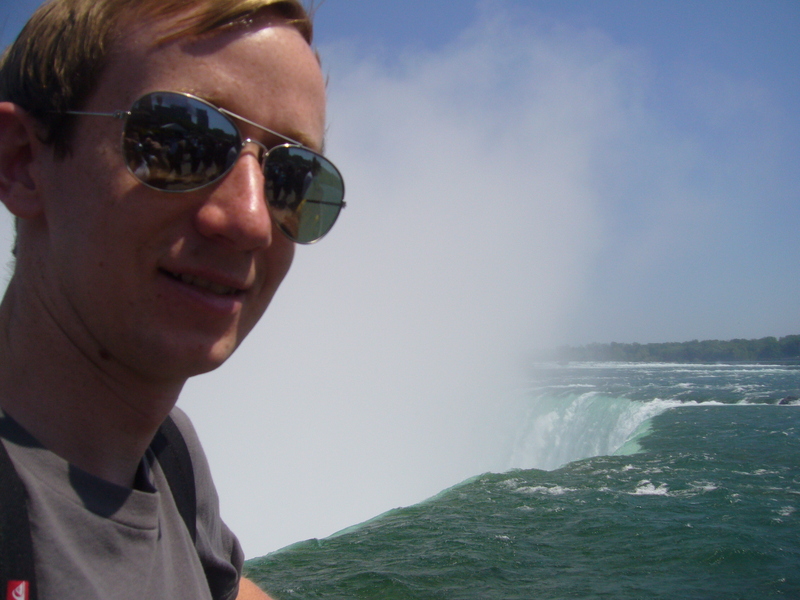 I had originally wondered how this experience would compare to my trip to Victoria Falls in Zambia a few years ago, but once I had seen the Horseshoe Falls I realized the two were not comparable. The American Falls are entirely in New York State, the crest is incredibly straight, especially when taken next to Horseshoe Falls. I was able to view them head on, and was impressed by the huge mound of rocks at the base of the falls created over years of erosion and rock falls and the level of spray that was crated by the sheer volume of water that plummets over the edge. This was nothing though, after the Horseshoe Falls. 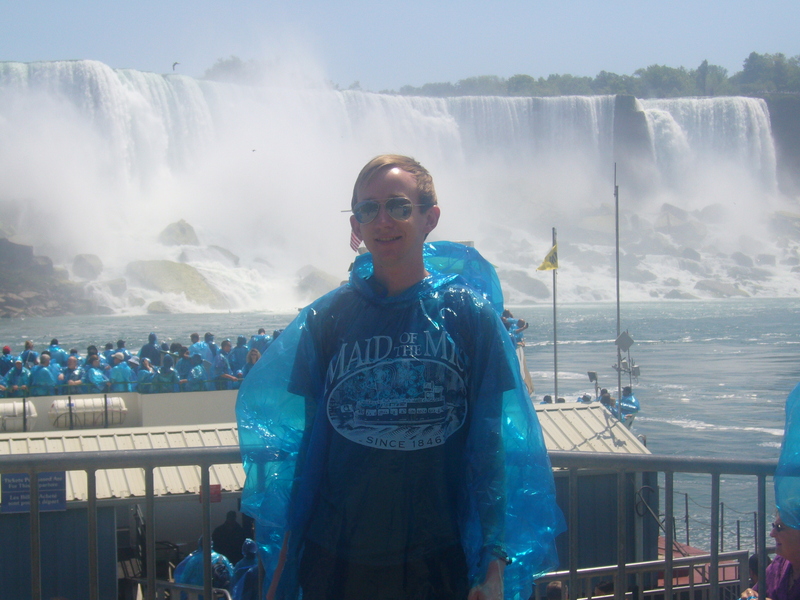 We decided that we should take the Maid Of The Mist boat-trip right up into the falls. We were lucky enough to be stopped right at the front of the queue as the next boat was full meaning we’d have first choice of where to stand and I knew that we were going straight to the front. 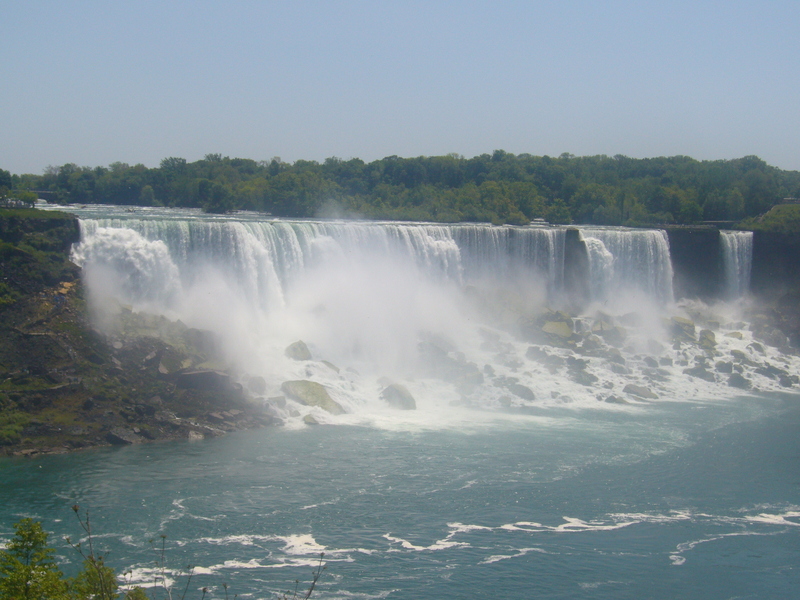 The journey begins by approaching American Falls where you are able to appreciate the full scale of the falls before being taken right into the heart of Horseshoe Falls. 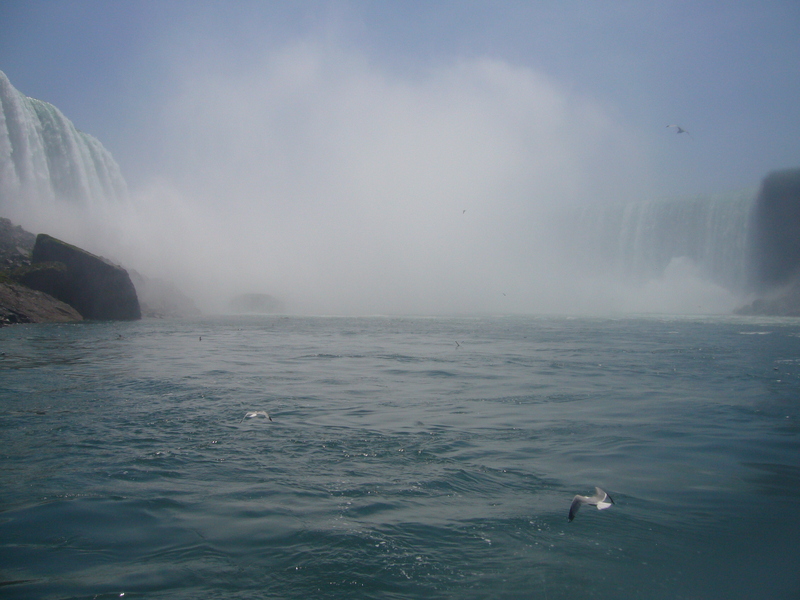 The mist and the spray increased dramatically as we approached, and the power of the water as it rushed downstream prevented the boat from moving too close to the falls, but once inside the crescent the experience is phenomenal. To your left and right you can see the edge of the falls and the water, which apparently travels at around twenty miles per hour crashing down onto the rocks below, but in front all you can see is a great wall of white, and the feeling that accompanies staring into the whiteness is nothing short of awe. The power of nature here is incredible! After several minutes holding in one position, the boat breaks away and returns to the American Falls before docking back where we began. 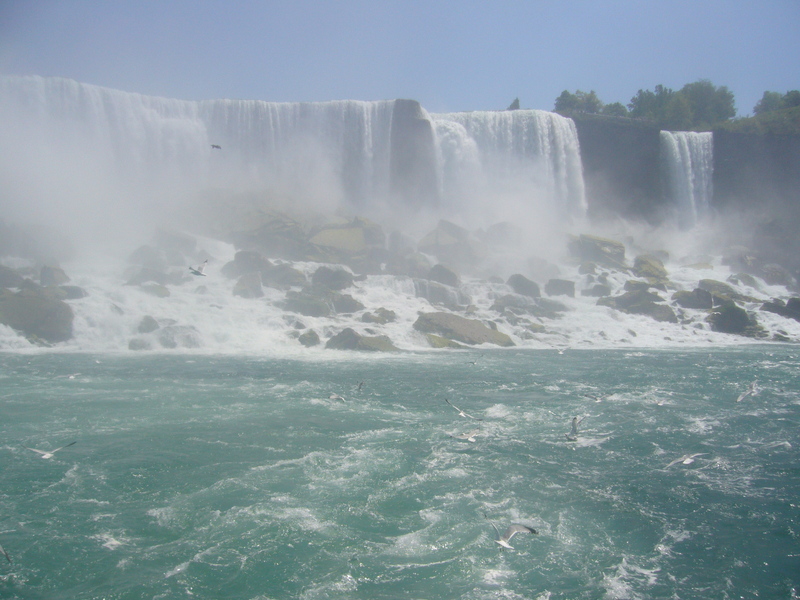 Once off the boat, we walked down to Horseshoe Falls, as they are primarily situated in Ontario it is possible to walk right up to the edge and once more witness the impressive power of the falls as well as their spectacular beauty. Once I had enjoyed my fill of the natural wonders in the area we made our way back to Clifton Hill to appreciate some of the tourism wonders and Ben decided we should go to Riley’s, which is a museum of sorts that holds a collection of weird and wonderful items all coming with a caption of “Believe it or Not? !” It was a little bit interesting, but having visited serious museums which document similar artifacts in much more depth and with an aim to educate rather than to shock I felt that the whole exhibit was a little lost on me. There was a spinning light tunnel though, and I hadn’t seen that in any museums and it did make me feel pretty dizzy so it wasn’t all bad. We stopped off for some dinner in a nearby bar and grill before driving back to Port Credit via Niagara On The Lake which allowed us to follow the course of the river from the falls down to the shores of Lake Ontario. 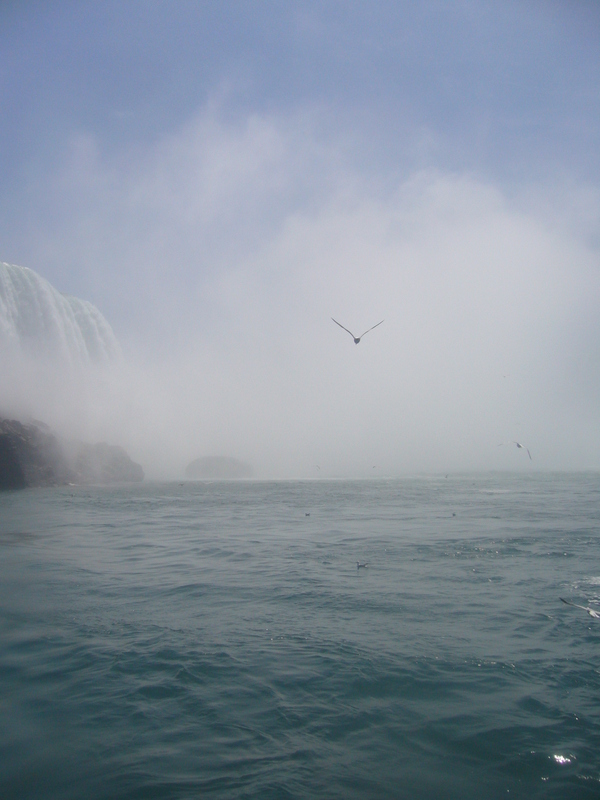 I think it would be safe to say that the experience of riding into the falls and staring into the misty unknown has been a highlight so far and I would strongly recommend a visit to Niagara Falls, even with the tacky side show.